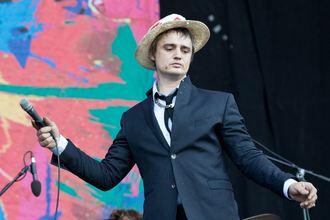 Pete Doherty is back in a Thai rehab centre. Two years after he was kicked out of a similar facility, the Libertines frontman is hoping to finally quit heroin and to begin “help[ing] other struggling addicts”. According to a statement provided to NME, Hope Rehab boss Simon Mott convinced Doherty to come to his centre outside Bangkok. Mott was previously a counsellor at the Cabin, a Chiang Mai rehab clinic that Doherty attended for a few weeks in 2012. The two men worked together until the singer was ejected due to disruptive behaviour. “Peter is not only a talented musician but a strong character who has a lot to offer,” Mott told NME. Doherty has been at Hope for about a month; he “does not suit typical treatment approaches – clinical environments limited by their setting and formality”, its spokesperson said. But now that the musician is on the road to recovery, “he has expressed a wish to use his influence” to support other addicts, and may even launch a trust “[to] fund treatment places”. Doherty is also receiving support from his Libertines bandmate Carl Barat. After a long hiatus the band reunited for gigs this summer and they are now working on a new album. “Pete’s in a great place,” Barat said in an NME interview. “[Rehab has] taken about 10 years off him.” The guitarist is visiting Doherty in Thailand and is going to “keep popping out” to write music together. They have about five songs “on the workbench” so far. The Libertines’ last, self-titled album came out in 2004.